New online casinos entering the iGaming industry have a deeply unenviable task ahead of them. It is necessary for these sites to quickly find themselves a position in the market, and the highly competitive nature of the industry thanks to the abundance of established sites that exist, as well as the regular new additions, make that no easy feat. That’s what makes it so strange when one comes across an online casino like Rich Ride, which is a brand-new site (having been launched in March 2018) and yet seems to have used design touches and a tone that felt derivative some ten years ago. This information may become less of a surprise when you discover that Rich Ride is a Nektan site, and Nektan is not an operator known for chasing originality. If there was ever a company that clearly follows the quantity over quality then that company is undoubtedly Nektan, with countless online casinos under their belt, none of which feel any different from one another. The design concept tends to be the only thing that sets the sites apart, and when that design is normally limited to one or two images, with the layout and other design touches being the same between the casinos, it’s no surprise that this network has released another lacklustre attempt. 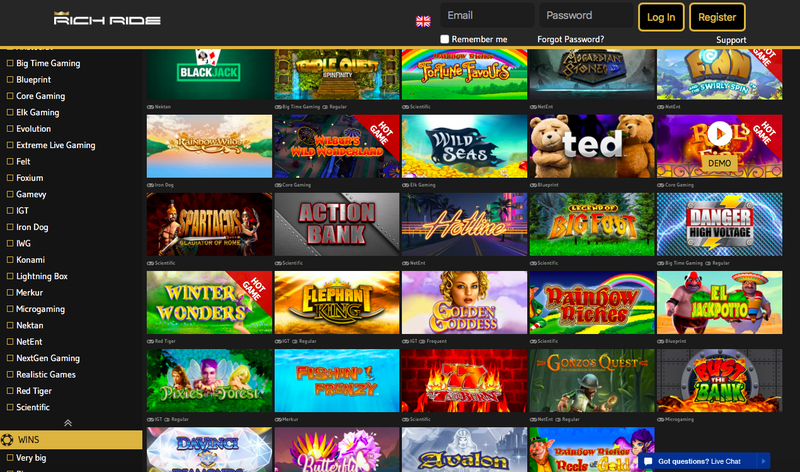 If you want to stand out as an online casino, don’t pick black and gold as your colour scheme. If there were a series of rules for success in the iGaming industry, that would be right up at the top, but this information doesn’t seem to have reached the ears of Rich Ride’s designers. The name suggests sports cars and decadence, and Rich Ride goes all in on that theme, well, as all in as a Nektan site ever does, in that there’s one image that represents the theme, everything else is the same layout (same thumbnails, same size, same order) as at most other sites on the network. The image that brings the concept to life (which is a strong term) is a casino lobby with marble effect walls and golden doored elevators, while two awkward looking models who (one assumes) are supposed to look glamorous stare uncomfortably out from the screen. 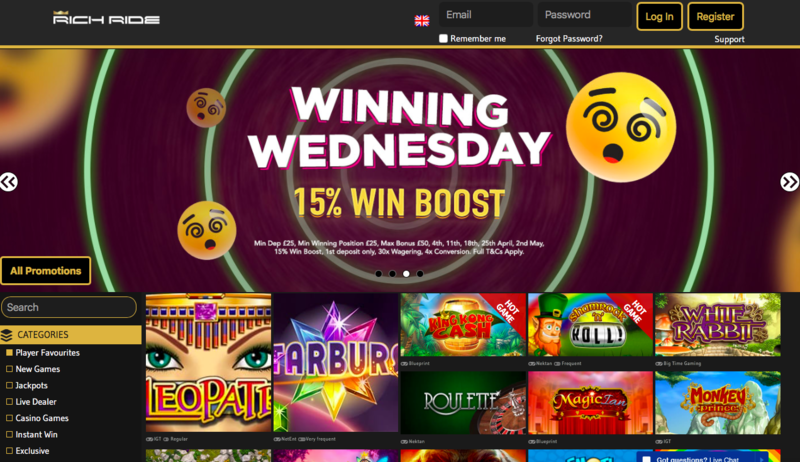 This isn’t only an immensely derivative design concept, it’s also an awful execution of it, meaning that not only does Rich Ride look like multiple other online casinos, it also looks worse than pretty much all of them! Now, it may have felt like this review was going to be entirely negative, but that is not the case, because Nektan have outdone themselves with the games available here. Nektan sites always have an impressive variety of games on offer, but at Rich Ride they’ve taken that to a new level, with titles coming from a huge list of software developers that includes 1X2 Network, Aristocrat Gaming, Big Time Gaming, Blueprint Gaming, Core Gaming, edict egaming, ELK Studios, Evolution, Extreme Live Gaming, Felt, Gamevy, IGT, IWG, Microgaming, Nektan, NetEnt, NextGen Gaming, Realistic Games, SG Digital, and SG Gaming. With pretty much all the big names in software development on that list (and a fair few lesser-known names and up and coming newbies) you’ll find a host of options available at Rich Ride, whether your preference is for slots, live dealer games, poker, blackjack, roulette, or scratchcards. Rich Ride may be one of the worst looking sites we’ve ever seen, which is saying something for Nektan, but it also has the best collection of games that we’ve seen from a new online casino this year, and that goes a long way to make up for it!